During the IPPB meeting, Secretary General, NFPE & General Secretary, AIPEU-GDS and other Representatives who attended the meeting raised the issue of implementation of GDS Committee report. Secretary, Posts informed that Finance Ministry has raised some queries on the Cabinet Note submitted earlier and returned it to Postal Board. Now, Secretary, Department of Posts has again sent the Cabinet Note to Communications Minister after replying the queries of the Finance Ministry. It is expected that Cabinet may clear the proposal without raising any further queries. 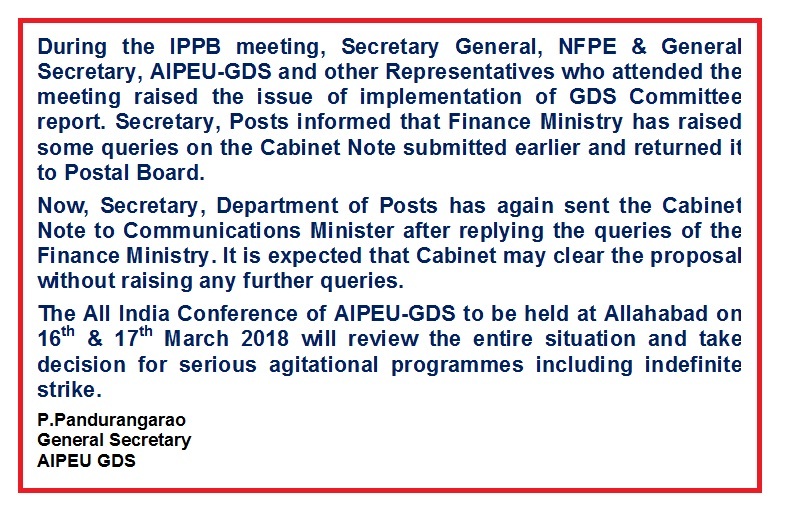 The All India Conference of AIPEU-GDS to be held at Allahabad on 16th & 17th March 2018 will review the entire situation and take decision for serious agitational programmes including indefinite strike.